Why 90 Days and Beyond? We have been saying for years that the best friend a client has in treatment is time. 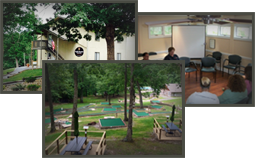 English Mountain Recovery was one of the first true 90 day residential treatment programs. Many friends told us people are too used to traditional 28 and 30 day programs and you won’t be able to survive. So why did 30 days in addiction treatment used to be the norm? It was set by the insurance industry and not from research based on effective levels of care. Since English Mountain Recovery began our 90 day program we have been busy treating our clients for our 90 day stay. Many of our callers are actually seeking 90 day programs and more. So maybe people are beginning to understand that more is better, the relapse rates are lower and outcomes are better with our model. Unfortunately, many callers are seeking treatment after multiple treatment episodes and have learned the hard way they needed a more intensive program. Even more unfortunate are those who believe all will be well if they can just go through a detox program. People are finding out the simple truth, sometimes the hard way, that the traditional models of treatment are usually not enough. There is now plenty of data that supports longer lengths of stay in treatment and the longer someone is engaged in a program the better their chances are for a satisfying lifetime of sobriety. Some old research claimed that once the brain damage occurs there is no hope for recovering from that damage. The more up to date research shows the brain can and does recover depending on the extent of damage, but it again takes time. In Volume 14, Number 5 (December, 1999), The National Institute of Drug Abuse issued this statement “The time depends on an individual’s needs. For most patients, the threshold of significant improvement is reached at about 3 months in treatment. Additional treatment can produce further progress. Programs should include strategies to prevent patients from leaving treatment prematurely.” NIDA refers to programs offering a true 90 day program as the new “gold standard” in treating alcoholism and addiction. Will we treat those asking for 30, 45, or 60 days? Yes we will accept them and some treatment is certainly better than none at all. Our staff and their client peers will be trying to get them to see they need more treatment in most cases. They will also get a recommendation to go to a quality sober living environment, therapy sessions and other recommendations after they leave us. 100% of clients leaving our program will get a referral for ongoing therapy, extended care, sober living and other modalities of the continuum of care. This transitional care allows clients, while in a sober living environment, to get the support needed in early recovery coupled with different levels of accountability. Some refer to what we do as “peeling the layers of an onion” until we get to some of the core issues needing to be addressed. The levels of acuity are going higher now than ever before. The younger population is becoming addicted at an even earlier age than in the past and the chemicals they are using are causing extreme emotional and psychological damage. This healing process usually cannot take place in a traditional 28 day program. Granted that 28-30 days is appropriate for many clients, we are seeing more clients with more trauma and psychological issues than ever before. If these issues go untreated and/or unidentified, the likelihood of relapse is greatly increased. Once again the extended length of stay is greatly encouraged. These longer periods of treatment are the absolute necessity for many and they are the building blocks to a new life and a new way of life without the use of alcohol or other drugs. Coming to grips with the fact that “I have the disease of alcoholism and/or addiction” is a great and often challenging feat! So now what am I willing to do to take responsibility and action to get better? People and their families are becoming more educated about the disease of addiction and are also coming to grips with the fact that “We must make a commitment to taking the necessary actions to take care of ourselves”. This goes for everyone in the family! Over the time of these relationships the “entire family” has become sick and dysfunctional.